I was looking for a good BUIS to suit my needs for the rifle build. I was looking at a variety of rear back up irons to install on the rifle and two really caught my eye before the LMT. The GG&G MAD and the KAC 200-600 micro both caught my eye for a adjustable BUIS for long range shooting, for both of these seemed like popular choices and would offer some weight savings over a carry handle or chopped handle. 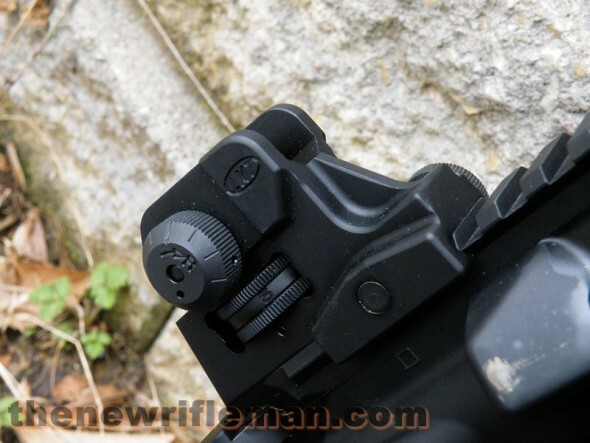 While they are nice options I decided that something with a broad range of adjustability would suit my needs better. A chopped carry handle would save weight over a full carry handle and utilizing a improved battle-sight zero would give me (roughly) precise ranging from 25-600 meters when utilizing a 62 grain projectile. It offers the ability to adjust (again with IBZ) -4 clicks to give me a small aperture 50 yard zero. The choice was clear but do expect to see the other two ranging BUIS here on thenewrifleman in the future. I found a LMT chopped on AR15.COM for $80. Excellent deal. The LMT chopped handle is a clean product with no snags and excellent machine work. It mounts well and has a solid lock up. Not to much to say about this product as it is simply a chopped carry handle… I am impressed with its quality and basic function. It mounts strong, click adjusts well, and will probably outlast the rifle. If only it were legal to use in high power or CMP matches. Overall it is a quality product and has not had to be re-tightened since being installed. It would be a good choice someone looking for a BUIS that has a ton of adjustment and is “always ready” to transition back from a red dot. Simple and reliable. I am glad I purchased this product. Thanks for your wealth of knowledge.. you have helped me tremendously.